Vimmia Zenith crop legging in Abyss. 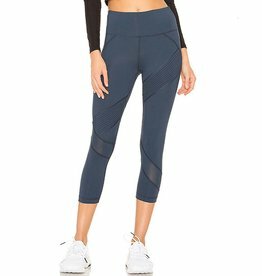 Vimmia "Purpose" camo-print leggings with mesh panels. High waisted cropped legging with minimalistic rubberized screen printed detail on outer edges of both legs. High waisted crop pant with bold jacquard black and white stripes on side panels.